2 weeks ago Digby and myself went to Rome to film a new Street Hunt video. Rome is a magical city, truly eternal and magnificent and I highly recommend you visit it to shoot in its streets. You can read more about our experience there in the Rome Street Hunt post we released when we got back from our trip. In that post I mentioned our days in Rome but left out the details of the actual Street Hunt day so I could give you all a thorough report today, on the day we posted the video on our YouTube channel. Digby Fullam of Street Hunters, Marcello Perino our awesome host in Rome, F.D. Walker our mate from Portland currently living in Istanbul, and myself, begun our recording in the Piazza Del Popolo. Piazza Del Popolo is a huge square that has two huge twin churches, Santa Maria dei Miracoli and Santa Maria in Montesanto, “guarding” the entrance to Via Del Corso. Via Del Corso stretches from Piazza Del Popolo all the way down to Piazza Venezia. So, we started with great light from the very top of Via Del Corso and slowly walked down it all the way until we reached the Piazza Venezia where we met Dan Redrup. Dan is a Streethunters.net Reader who asked to meet us on Street Hunt day and to participate in our recording. We met him about 1 hour after we started and then headed off to the Colosseum. Unfortunately the light went at this point and we all got a bit frustrated by that, but we didn’t give up. We continued on with the plan and followed our designated path. When we got to the Colosseum we shot for 30 to 60 minutes around the ancient Roman arena and then we took a side street and headed towards a restaurant our guide Marcello recommended. The Ai Tre Scalini. While there we had a great lunch. Check out the mention of this on the video at minute 8:15. You can really tell we liked the food! Anyway, after lunch we found ourselves taking photos in some lovely light. The combination of the bright light, food and beer in our bellies and high spirits, gave us a newfound inspiration and courage to get closer and take more interesting shots. We took photos of Catholic nuns and people from all over the world. We even met an interesting man from Colombia. We kept on shooting all along Via dei Fori Imperiali, the large street that connects the Colosseum with Piazza Venezia, until we reached the large square and continued down Via delle Botteghe Oscure and into the Jewish Quarter. By this time we were literally chasing the autumn light that was eluding us due to the high Roman buildings surrounding the little pathways we were walking through. Once we finished with the Jewish quarter we moved to Campo de’ Fiori where we all took photos of a specific lady and I am pretty sure we freaked her out! From there we moved to the amazing Piazza Navona where we decided we couldn’t work with the available light any more and equipped our flashes to make things more interesting. In Piazza Navona we had plenty of fun and stayed for quite a while, shooting and flashing whoever we found interesting. I met a little nun, Digby got to flash his favorite lady from Campo de’ Fiori all over again, Forrest, who was on a roll, met another really lovely lady (ref Street Photography in Rome, Italy post), Dan observed from above and Marcello redefined the meaning of shooting up close! Once Piazza Navona was done, we left heading back to Piazza Venezia while experimenting with Multiple Exposure photography. Dan explained to Digby the process who later explained it to me. We made a few shots in the video for you to see how Fujifilm helps the photographer when shooting Multiple Exposures. A short while later we had reached the Piazza where we decided to end the Street Hunt. Let me confess that I wish the Street Hunt hadn’t ended when it ended, but something happened that made me lose focus in the Street Hunt and got me slightly worried. My Fujifilm EF-X20 flash fell on the ground and broke. I was so into using my flash for the past hour and the light was so good for Flash Street Photography that damaging my flash had such a great impact on me that I suddenly felt like I had to stop. I hope you guys understand this. It took me 1 week to get my flash fixed. I had it taken care of when I got back to Crete. Anyway, we still had an amazing time and managed to get a few good shots. 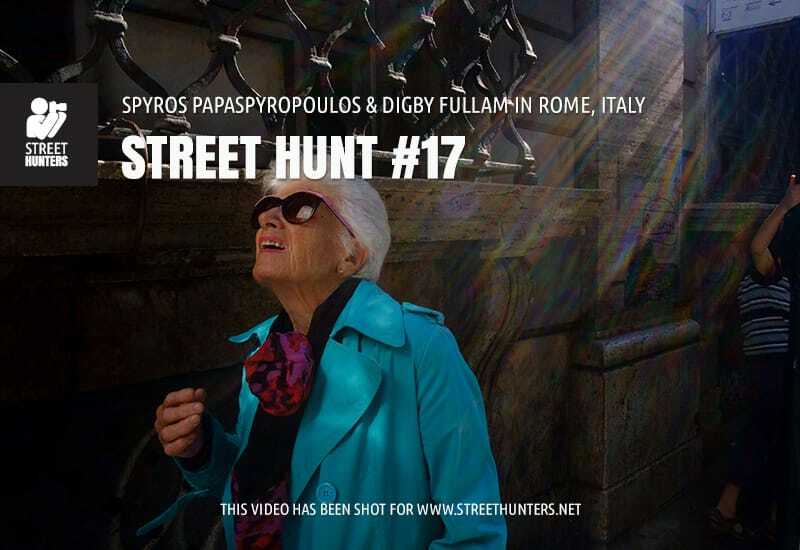 In this Street Hunt video both Digby and myself use the APS-C Fujifilm X-Pro1 with various settings depending on the light. We used both zone focusing and auto focus. The lens we used was the XF18mm by Fujifilm that is equivalent to 27mm full frame. So it is quite wide, just what we needed for getting close! The video camera we both used to record our part of the video was a Sony Actioncam. I used EF-X20 flash and Digby used the Canon 430EXII flash. As you will hear Digby explain at the beginning of the video, we both used the same gear so you can get a Tag team experience. We hope you enjoy this new concept for our Street Hunts! Now the time has come to relax, order some pizzas, burgers or get some popcorn and grab your favourite beverage and enjoy the fun! Today’s Street Hunt is 31 minutes! As always, in addition to the video we have made a collection of all the photos we shot, and I am also sharing with you photos made and shared by Marcello and Forrest. Thank you so much guys for showing us around and letting us share your work! If you want to check out the photos we shot, we have uploaded every image we shot in dedicated Dropbox Albums. For more of Marcello’s work, please visit his website. For more of F.D.’s work, please visit his website.